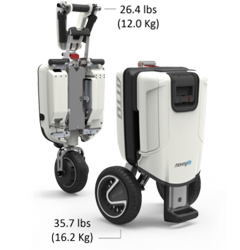 ATTO is an advanced mobility scooter offering ultimate mobility and can be folded within seconds to the size of a trolley suitcase. ATTO is specially designed for people, young and old, that need a mobility aid. By definition, a Travel Scooter or Folding Scooter should be easy to open and close, and easy to transport. The ATTO does exactly that! Unfolded the ATTO is a breeze to ride on. Ergonomic and height adjustable seat, height and angle adjustable steering rod and display and a wide chassis makes it very comfortable to ride. The operation is so easy, anyone can learn in a few minutes. The speed is limited to pedestrian use and within that range, it is very easy to choose the speed you want. The display is easy to read and has an indication for speed, direction and the battery level. 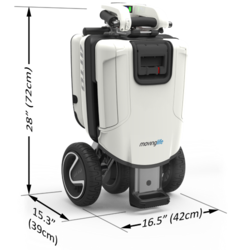 Most fold-able mobility scooters are just fold-able and light. They lack durability and comfort. And not to mention, looks. ATTO is fold-able, light, durable, comfortable and very beautiful. The ATTO folds to the size of a travel suitcase in a matter of a few seconds and can be wheeled behind you with great ease. This is ideal for traveling through airports or bringing with you on the train, coach or on a cruise holiday. You can chose to fold it into parking mode and trolley mode. Parking mode is the smallest option and this way ATTO is easy to lift on its two hand-grips. Trolley mode gives you the possibility to roll the ATTO without effort. The big wheels roll easily and by adjusting the length of the steering rod, you can make it as comfortable as you want. In both modes, ATTO can stand independently; this makes it easy to store too. Moving Life made no compromise in quality and durability, which translates into a total weight of 30kg. To still make it easy to lift, to put into your car or carry up the stairs, the ATTO can be split in two parts – three actually, if you take out the battery. It splits apart in a few seconds meaning the heaviest part you lift is just 16.2kg. 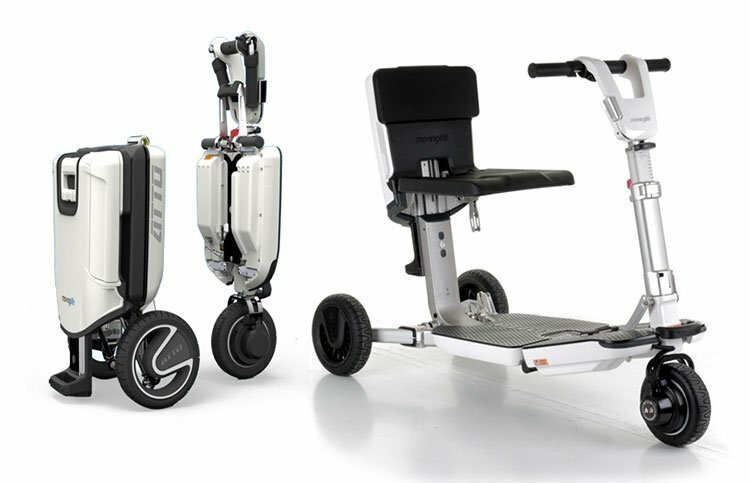 Each part is lighter than any mobility scooter on the market so ATTO is super portable. And the rear end, the heaviest part, can stand on its own. It makes splitting super easy. 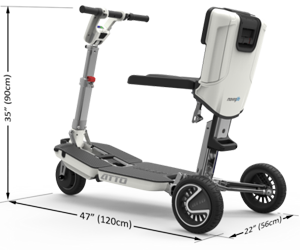 As of this writing, the ATTO mobility scooter is available on Amazon for $3495. Do you deliver to Muscat Oman? Do Medicare , will help to pay this? My husband is about 200lbs…can be used this one?